This movie rules & when younger lived for it. Two kids suddenly thrown into a goosebump-raising thriller! Moving ending as boy faces profound choices. Remember that little boy named Elliot from the film E.T. the Extra-Terrestrial (1982)? Well, his name is Henry Thomas, and while that was certainly the role he will probably be forever tied to, he actually did go one to make a number of films after that, including this one titled Cloak & Dagger (1984), and has been working steadily ever since, overcoming the general conception that child stars who peak so early often end up as casualties of The System, their careers, and their lives, on a continual downward spiral eventually ending up as fodder for some sleazy tabloid talk show, but I digress...directed by Richard Franklin (Roadgames, Psycho II), the film stars, as I've mentioned, Henry Thomas, along with Dabney Coleman (Tootsie, Wargames). Also appearing is Michael Murphy (Count Yorga, Vampire, Shocker), Christina Nigra (Twilight Zone: The Movie), the eternally crusty John McIntire (Psycho, Elmer Gantry), Jeanette Nolan (she was the voice of Mrs. Bates in the original Psycho), and William Forsythe (The Rock). Also appearing in a `don't blink or you'll miss him' role is Louie Anderson, in an unforgettable performance in the character credited as `Second Taxi Driver'. Thomas plays Davey Osbourne, a boy obsessed with role playing games, especially ones featuring a fictional super-spy character named Jack Flack who Davey projects as a real person, often having conversations and receiving advice from throughout the film (the character of Jack Flack is played by Coleman, who also has the role of Hal Osbourne, Davey's recently widowed and somewhat strict, but loving, father). 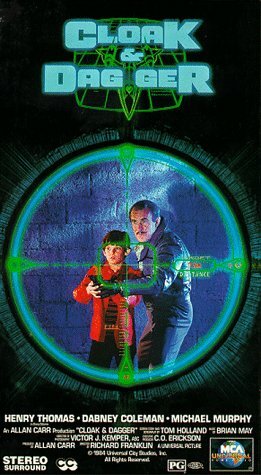 While running an errand for a friend, Davey witnesses a murder, comes into possession a video game cartridge that contains valuable government secrets, and is now hunted by a trio of men, led by a man named Rice (Murphy), who wishes not only to retrieve the cartridge, but also to eliminate the only witness to their crime. Davey tries to tell others what happened, but his story is so fantastic that not even his best friend Kim (Nigra) or his father believes him, chalking it up to his overactive imagination. The situation becomes even more desperate as it seems the men will do just about anything, including kidnapping and more murder, to get back that which they've stolen and since lost. With Jack Flack's help, Davey must now try to outsmart the criminals and be the hero, but he will learn the world of make believe is a whole lot different than real life, especially as the danger poses a threat to not only him, but those around him. He'll also learn that heroes aren't necessarily defined by extraordinary actions, and they often can be found in the least likely places, not confined to ones imagination. If you're a fan of such 80's films like Wargames (1983), The Last Starfighter (1984), and Gotcha! (1985), then you'll most likely enjoy this film. The story is decent and flows along at smooth pace, despite any number of plot holes that present themselves (there are plenty, but given the kind of film this was, I was willing to not so much focus on details but just have fun). None of the performances here will win any awards, but everyone did well enough, displaying a level of professionalism consistent with their respective abilities. I did feel Michael Murphy was very convincing as the main villain. One thing that seemed a little creepy was the overall eagerness of the villains to do great bodily harm to the kids, specifically the scene where Murphy's character had Davey cornered and is describing all the things he's going to do to Davey for all the trouble he's caused...he spoke in great detail about how he was going to blow off Davey's kneecaps and then shoot him in the stomach just so he could watch him suffer a slow and agonizing death. What was weird about it was the expressive and explicit focus of violent intent to a minor...this is something I'd expect to see in a Quentin Tarantino or Sam Peckinpah film, but not so much in a film like this...I've seen films involving children in danger, but the threat of serious injury or even death seemed unlikely. The film takes place in San Antonio, and makes good use of a lot of visually interesting locations for many of the scenes including The Alamo and a place called the Japanese Tea Gardens. Another element of the film I really liked was the original music score composed by Brian May (not the guy from the band Queen), who has also scored such films including Mad Max (1979), Mad Max 2 (1981) aka The Road Warrior, and more recently Chicken Run (2000), all three films featuring Mel Gibson (Chicken Run featured Mel's voice for the main character, as it was an animated feature). Oh, in case any of you younger viewers are wondering, the game console featured in the film is called an Atari 5200, which came onto the market in the early 80's (1982, I think). It didn't sell as well as the earlier Atari 2600, but know that there was console gaming before PS2s, Nintendo Game Cubes, and your beloved X-Boxes...the graphics shown here were representative of the games at the time, and while they may look crude and rudimentary now, they were good enough for us as we spent (or wasted) many an hour glued to the television in our continual efforts to improve out hand-eye coordination. The anamorphic widescreen picture (1.85:1) looks very sharp and clean on this DVD, and the Dolby Digital 2.0 audio comes through clearly. There are no special features available, not even a menu, as the film starts playing once the DVD is inserted into a player. As the film ends, it goes back to the beginning and starts over again. Some extras would have been nice, but I can be content with what's here.